Our back deck ceased to be a restaurant for birds several months ago. I decided it was time to put out some seed again. As usual, $US10,000 worth of brightly coloured beasties turned up shortly afterward. Along with the usual Sulphur-cresteds and rosellas, this time we got a couple of galahs. 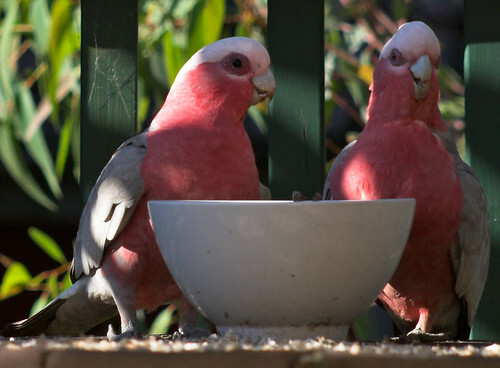 We've had a galah or two hanging around the seed before, but I never got any photos of them. They're pretty birds, and relatively reserved when there are only a few around. Get a few hundred of them in one place, though, and they turn into one of the world's premier sources of frivolity. 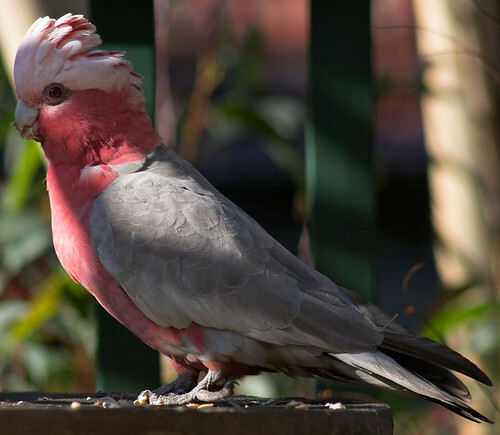 Galahs have a crest, but it's not nearly as impressive as that of the Sulphur-crested. 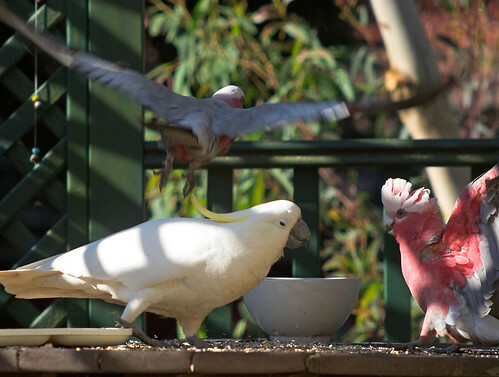 As with the big cockatoos, they raise the crest when excited. ...because the bigger birds, as usual, insisted on pointlessly bullying them. This sort of inter-species animosity is one of the reasons why conservationists don't actually much like backyard bird feeders. An unnaturally large and reliable food source in one very small area forces different bird species to rub shoulders, and they never seem to enjoy that very much. They never actually seem to come to blows, though. Even when the notoriously aggressive currawongs show up and start staring down the cats through the window, the other birds just give them a wide berth and come back later. Looks like the first couple of frames from a bird blowing up.